About the Children's Department: Thank You for Reading About the Children's Department! Thank You for Reading About the Children's Department! Ministry Blogs for 2014 as rated by Sam Luce (see this link)! 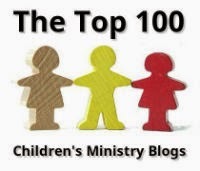 I also found out we are one of the Top 100 Children's Ministry Blogs (we came in at #25!!) as rated by Tony Kummer at Ministry to Children (see this link)! Thank you so much for taking the time to read About the Children's Department! I sincerely appreciate each of you - please follow these links and check out the wealth of resources, ideas, information, and help which you will find at both these sites! Your blog is my favorite!